This certainly proved true in the case of Adolf Hitler, Germany’s Fuhrer from 1933 to 1945. And it’s proving the same for Donald J. Trump, who became President of the United States on January 20. 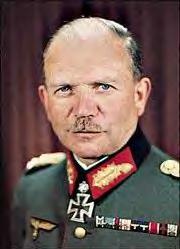 One of the most perceptive observers of Hitler’s character was Panzer General Heinz Guderian. Guderian created the concept of motorized blitzkrieg warfare, enabling coordinated masses of tanks and planes to strike at the vital nerve centers of an enemy. As a result, Guderian enabled Hitler to conquer France in only six weeks in 1940, and to come to the brink of crushing the Soviet Union in 1941. He recounted his career as the foremost tank commander of the Third Reich in his 1950 autobiography, Panzer Leader. Chris Uhlmann, political editor for ABC News, has reached similar conclusions about Trump’s own authoritarian character. Uhlmann started his journalism career at The Canberra Times in 1989 and edited The Canberra Weekly before joining the ABC in 1998. HEINZ GUDERIAN: Once in power, Hitler quickly—and violently—eliminated his opposition. He make no attempt to disguise this aspect of his character, because the opposition was weak and divided and soon collapsed after the first violent attack. This allowed Hitler to pass laws which destroyed the safeguards enacted by the Weimar Republic against the the dangers of dictatorship. Another keen assessor of Donald Trump’s character is David Brooks, conservative columnist for the New York Times. DAVID BROOKS: “The odd thing about [Trump’s] whole career and his whole language, his whole world view is there is no room for love in it. You get a sense of a man who received no love, can give no love…. HEINZ GUDERIAN: Everything on this earth that casts a glow of warmth over our life as mortals—friendship with fine men, the pure love for a wife, affection for one’s own children—all this was and forever remained unknown to him. HEINZ GUDERIAN: He lived alone, cherishing his loneliness, with only his gigantic plans for company. His relationship with Eva Braun may seem to contradict what I have written. But it is obvious that she could not have had any influence over him. And this is unfortunate, for it could only have been a softening one. Adolf Hitler’s manic desire for conquest left Germany a thoroughly destroyed and defeated nation in 1945. “…Mr Trump has pressed fast forward on the decline of the US as a global leader. He managed to diminish his nation [at the G20 Summit] and to confuse and alienate his allies.